So many centuries and so few weekends. 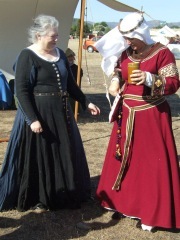 Here are a few of the outfits that we wear to different events. 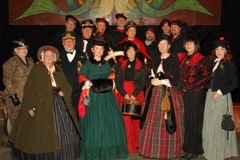 The photos are curtesy of many friends and professional photographers are noted where appropriate. Some of the photos have larger versions if you click on them. Photo by Stephen Jacobson. This was taken 1998(?) 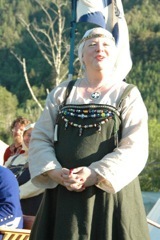 at one of our Renaissance Miliarty Society Emperor's Birthday gathers. 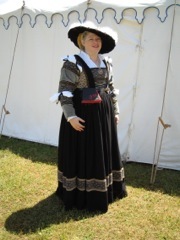 We were all in German or English clothing of the 1600's. Photo by Shannon McSmith. 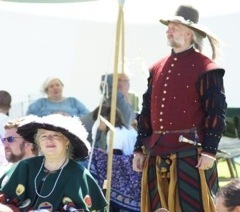 German Renaissance garb. Viking - at a West AnTir War (2012). I was the Arts and Sciences Minister and had to make announcements. Wearing lots of hand made beads. 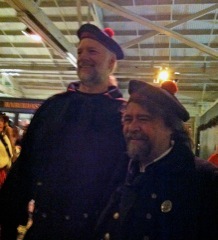 Will and I coming forward for the Invocation Ceremony before one of the fighting lists. Will is carrying my banner. I am in Viking and Will is wearing his heraldic surcoat. 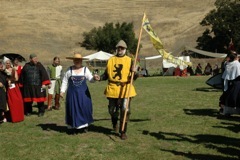 Will in 14th C garb marshalling one of the fighting fields. WAR! Smallish battle. 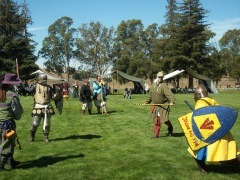 Those in surcoats of blue, black and red are part of fighting unit that Will's fights with at wars - the Gryphons Guard. 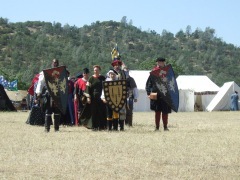 Will is on the right in Gryphon's Guard colors and carrying the shield of the gentleman of the Guard who was being knighted that day. 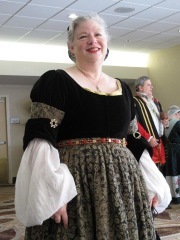 I am further back in the procession wearing the dress as seen in the next picture. To complete my colors I wore a red hood. 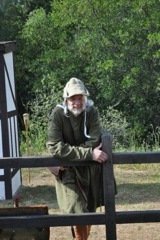 Will in his 14th C garb at Erinwood. Waiting for court to start at an event. My mantle was a gift when I became a Pelican (lifetime service award). 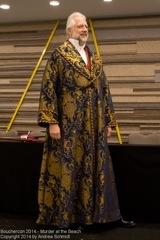 Will is in his Renaissance Germans. 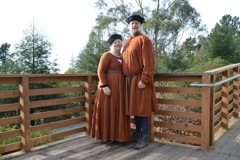 Fancy Renaissance Germans at a 12th Night. 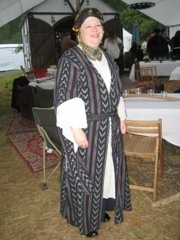 It was warm so I was not wearing my pearl and coral gollar (mantle). 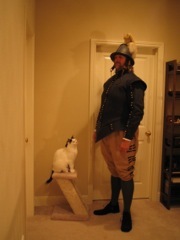 Will posing in his early 17th C. Lowlands military outfit. 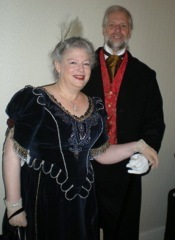 Regency clothing for a ball at Renovation - the World Science Fiction Convention in Reno. On occassion we do Middle Eastern - nice change for very hot days. 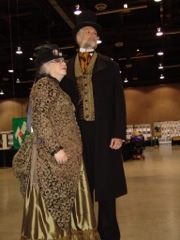 My 1870's walking dress and hat. The fabric is a reproduction cotton. 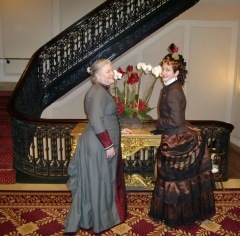 Opening night of the Embroiderers Guild of America National Conference in San Francisco. 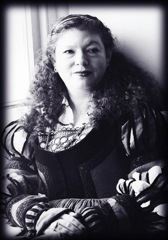 Stitching on the Barbary Coast. I was the Region Director for the host Region. 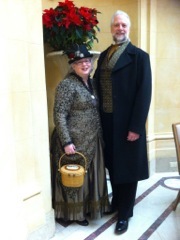 I wore my 1890's gown and Will his Frock Suit. 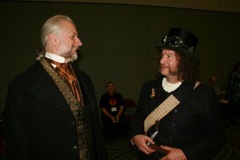 Will in his Victorians with Martin Spitzman doing Steampunk at a Renovation Ball. 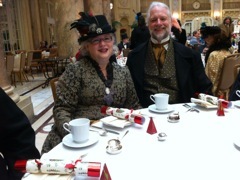 Tea at the Palace Hotel. At Renovation in our Victorians. 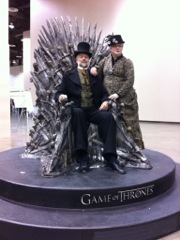 Sitting in the Game of Thones Throne at Renovation. 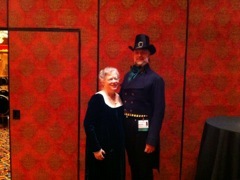 Will in his Victorians at the Fashion Show at Bouchercon. 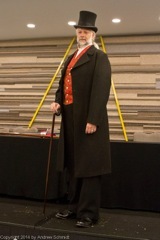 Will wearing his Banyan - an at home for the Victorian gentleman. 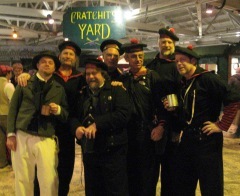 The Hatefish Crew at Dickens Faire. 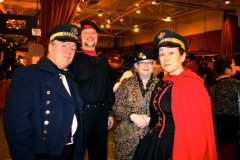 The group is dressed for a submarine unit circa Jules Verne. The tallest and the shortest members of the crew.